For such a small food item, garlic gets a lot of gadget attention. Kitchen tools exist that will smash, grate, pulverize, press, chop, slice and dice the fragrant little clove. And now, the Garlic Card looks to add to the fray. Consisting of no more than a piece of pockmarked plastic with a series of rasps, the no-nonsense tool minces garlic easily. Perhaps best of all, the easy-to-use prep tool cleans easily under soap and water or in the dishwasher. It won’t give the same enjoyment that comes from say, whacking a clove with the broad side of a chef’s knife, but at least it doesn’t involve picking wasted garlic bits out of of one of those horrible garlic presses. Direct from Europe and only available in the U.S. from Chef’s Resource. A great alternative to mincing garlic is grating it on the Garlic Card. The slim little invention was thought up by a Swedish innovator in an effort to minimize the struggle of pureeing garlic. A series of rasps along the surface of the card grate garlic into small pieces and keep it all contained for easy addition to the pot or pan. The unique shape of the card has an upturned end that is easy to grasp while you grate away. Unlike difficult-to-use contraptions and garlic presses, the Garlic Card is easy to use and easy to clean. Simply wash it with soap and water or throw it in the dishwasher. 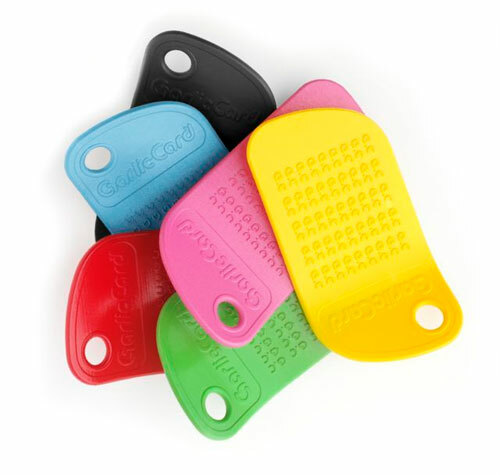 The Garlic Card is available in a number of bold colors including red, blue, green and black. Add garlic to any of your dishes with ease when you have the Garlic Card. The compact size makes it easy to toss into a knife bag for the chef on the go or for easy storage in a drawer. The most tedious of all the prep tasks seems to be mincing garlic. Dozens have tried to design the best device and one has succeeded. Swedish chef turned inventor Herman Rasmuson created the Garlic Card after frustration over trying to mince and puree garlic. Inspired by the shape, size and raised rasps of a credit card, Rasmuson designed the first Garlic Card. Now with a new design that includes a bent end that provides a place to grab, the Garlic Card is even more useful that before. The small card is easy to use, easy to clean, easy to store, and easy to transport. Designed by a chef, the Garlic Card works effectively to mince garlic into a smooth puree for addition to sauces, dishes and butters.